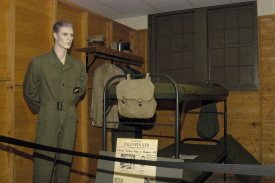 The Great Lakes Naval Museum at Great Lakes Naval Station offers a panoramic history of the United States Navy's enlisted Sailor, emphasizing the story of turning civilians into Sailors. The museum serves as a visible reminder of the Navy's strong roots in the Midwest and the station's hundred-year history as a center of recruiting, training and pride. The museum is located at Building 42 next to the visitor center near the main gate of the Naval Station. Admission to museum complex is free. Inside the museum you find a diversity of history preserved and presented in an educational environment. You will not want to miss visiting this museum during your stay in the Great Lakes Naval Station Area. The Navy Pier is Chicago's lakefront playground. And it's Chicago's #1 tourist and leisure destination, attracting more than 8.6 million visitors a year. The pier is open year around. From rides to restaurants, exhibitions to entertainment, shopping to dining cruises and tour boats Navy Pier has it all! Recommend taking the train to go downtown Chicago. There is a train station at Great Lakes and one at Waukegan at the end of Washington street. You can get a weekend pass to ride for $7 which can be used on Saturday and Sunday. This will help you avoid the traffic congestion and parking fees of $20 and up. The ride is approximately 55 minutes. Shedd Aquarium located near the shore of Lake Michigan provides visitors with an opportunity to view over 32,000 animals from both fresh water and salt water. From snails to whales. You will not want to miss an opportunity to see the diversity of marine life at this unique aquarium. Visit the Shedd Aquarium Website for more information. Gurnee Mills, the largest outlet and value retail shopping destination in Illinois, provides the ultimate shopping experience with more than 200 stores including Neiman Marcus Last Call (the only one in Illinois), Saks Fifth Avenue OFF 5TH, Forever 21, H&M, Guess Factory Store, Tommy Hilfiger Company Store, Abercrombie & Fitch Outlet, Hollister Outlet, Gap Outlet, Nike Factory Store and Bass Pro Shops Outdoor World. Shoppers can dine at great restaurants including Rainforest Café and Ruby Tuesday, catch a movie at Gurnee Marcus Cinema 20, enjoy indoor ice skating, miniature golf and laser tag at Rink Side Sports, or get up close and personal with the reptiles at Serpent Safari. Lincoln Park Zoo is one of the nation's oldest zoos housing 1200 animals representing 230 species. Admission is free and parking is $19. Lincoln Park Zoo is located off Lake Shore Drive at the Fullerton Parkway exit, just minutes north of downtown Chicago. From I-94, exit at either Fullerton Parkway or North Avenue and go east. A complete list of attractions for the city maybe viewed at the "Chicago Tourism Bureau" website.